Indian vice-captain Ajinkya Rahane feels that the batsmen will have to show a lot of patience if they are to find success in the upcoming four-Test series against the West Indies. The first Test begins in Antigua on July 21. “I think as a batting unit we have been doing really well. As much as we are learnt from the South Africa series, it is all about focusing on this series now. Patience will be the key as a batting unit. “Once you get set it is important to make each and every session count, because we will have to give time for our bowlers. It is not easy to take 20 wickets on these slower tracks. As a batting unit we will have to take responsibility and I think one or two batsmen will have to get set and score big here,” said the middle-order batsman. “If you are used to getting 100 off 150 balls, maybe here you will have to get 100 off 250 balls. So, as a batsman it is important to play at least 200-plus balls here,” he added. Of course, the pitches to be laid out for this series will be focus too. On Monday, the wicket at the Sir Viv Richards Stadium here bore a brownish hue, with only a sprinkling of patches of fresh grass to hold it in together. If it retains its look, it will be in keeping with the wickets turned out for the two practice games in St. Kitts. “I think we will get similar tracks (in the Tests) but here we will have to wait until July 21 to see how the wicket finally looks like. But in St. Kitts it was a really slow track, a bit similar to Indian wickets and we are preparing for slow tracks in the series. 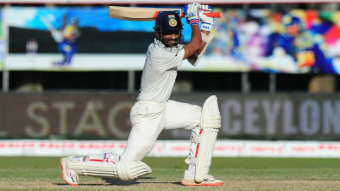 So the two practice matches were really crucial for us and this first game will give us momentum,” said Rahane. Rahane praised the bowlers for their persistence during the two warm-up games. “I think all the boys did really well in the two practice games, especially bowlers because wickets were slightly on the slower side. It was very challenging for the bowlers but I felt they bowled really well. Even the spinners did well, Amit Mishra in the first game, then R Ashwin and Ravindra Jadeja bowled in partnership in the second game. I think the bowlers will have to be consistent in their line and length, as well as be patient. They will have to bowl in partnerships on these slow wickets,” he added. The West Indies team arrived late in Antigua on Sunday night, and after their training camp in Barbados last week, opted not to practice on Monday. Their preparations will begin in earnest on Tuesday, and even if the current squad might not bear the aura of the past, the young visiting Indian team is under no illusion about the upcoming series. “It is important to give respect to each and every opponent. I think West Indies have a decent attack in Jason Holder, Shannon Gabriel, Carlos Brathwaite and Devendra Bishoo. It is important to give respect to them and play according to the merit as a team. “You cannot take anyone lightly and as long as we play to our strengths and potential, it will help us in this Test series,” Rahane signed off.